Yukinoshita Yukino's name contains the Japanese character for snow twice, which happens to be an all too fitting representation of her personality. To an outsider, Yukino is cold, calculating, and blunt. She will not hesitate to give her exact opinion on other people, however piercing it may be. None of her classmates seem willing to understand her, but Yukino does not mind that. She will nevertheless afford a few minutes to "educate" those incompetent with her "grace." But the view from the top of the world can sometimes be... cold. For those who do know her better, Yukino expresses a different kind of coldness. But to begin with, most of them see her as nothing but a shadow of her older sister. Yukino's relationship with her sister is both a blessing and a curse, a dream and a nightmare. She is Yukino’s measuring stick in terms of capabilities and the target of Yukino’s jealousy. 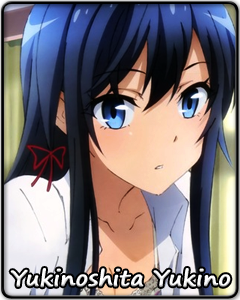 She is Yukino’s idol, the person whom Yukino wants to overcome, and the last person Yukino wants to be acquainted with. Yukino knows she will never be like her sister, yet people still expect her to. She can never meet their expectations. Behind the cold eyes hides a lonely girl trapped in a barren middle ground between two worlds. She sits alone in an empty room with no one to talk to but her shadow. A warm ray of light shining through a cool, frosty window reminds her not only of the coming of spring, but a second chance to unite the two distant worlds into her own. Maybe then can she smile with more radiance than a flower blooming through the melting snow.